It has been a relatively quiet Bank Holiday weekend in Malvern House, as with public exams approaching the girls have been focused on their studies. On Friday evening Agne, Alysia and Benny went into town for a meal which they enjoyed very much while the other girls who were staying for the weekend relaxed in the house, watching a DVD, chatting or using the internet. On Saturday morning we had brunch and then most of the girls settled down to some study or popped into town to pick up some bits and pieces. Beccy travelled to Plymouth to meet the travel agent who she has booked her gap year round-the-world trip with, so she returned to the house in the evening full of excitement about her up-coming adventures! Veronica and Ankie also got creative in the kitchen, cooking up a wonderful smelling range of Chinese dishes and Nini spent most of the day up in the school gallery, working as a steward for our new exhibition. On Sunday we enjoyed another brunch and then the day panned out much the same as on Saturday. The school library was also open both days and several of the girls took the opportunity to work in there, safely away from the distractions that lurk in their bedrooms! In the evening, all of the boarding community gathered in the school dining hall for a curry night and we enjoyed a really lovely and filling meal! On Monday, after brunch, Ankie and Veronica went up to school for extra Maths revision classes with Penelope and Christy heading into town for the day with a visiting friend. 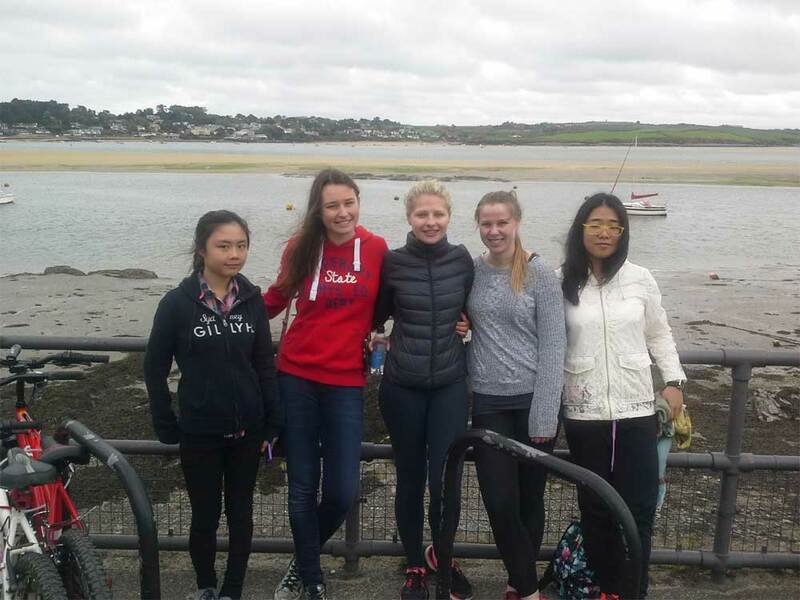 The rest of the Lower Sixth girls and all of the boarders from the other three houses set off for Wadebridge, where we collected our bicycles in order to cycle 8km along the Camel Trail to the beautiful, seaside town of Padstow. There was only one light shower on the way and so we all managed to enjoy the scenery and then reward our efforts with an ice cream in Padstow! The girls had an hour to explore the town and then we cycled back to the waiting minibuses in Wadebridge. Featured Image: Alysia, Anna, Agne, Carissa and Alice in Padstow. On Monday evening the girls relaxed and prepared themselves for the week ahead. Carissa has her AS Level Spanish oral exam this week so we all wish her the very best of luck with this.